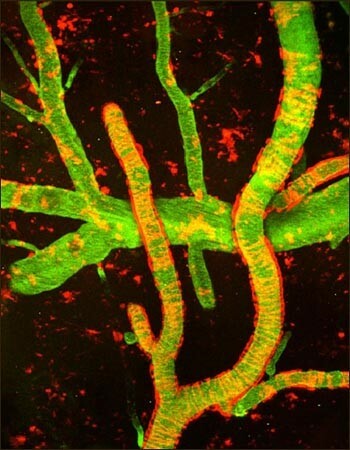 Can Dysfunctional Clotting Contribute to Neurological Disorders? What causes Alzheimer’s disease? Currently, there is no clear answer. As the disease progresses, brain cells are destroyed, and small bleeds occur in the brain’s vasculature, leading to dementia. Clumps of beta amyloid protein in the brain, termed plaques, are a hallmark of the disease, yet it is unknown how these plaques contribute to destruction of the brain cells. Beta amyloid can also accumulate along blood vessels during cerebral amyloid angiopathy (CAA), which occurs in over 90% of patients with Alzheimer’s disease. It is also unknown how these deposits form.3 In work performed at the Centre for Blood Research, PhD candidates W. Hur and N. Mazinani demonstrate beta amyloid can be covalently linked by activated FXIII (FXIIIa), a coagulation factor found in the plasma and in platelets, the cells responsible for blood clotting. The role of FXIIIa in blood clotting is well-defined: FXIIIa links strands of fibrin to each other to form a stable meshwork that forms the clot. While FXIIIa co-localizes with beta-amyloid deposits in the brain, it was unknown whether FXIIIa could also act on beta-amyloid, as it does with fibrin. In the recent publication, W. Hur and N. Mazinani show for the first time that beta amyloid is a substrate for FXIIIa. FXIIIa obtained from either plasma and platelets can link beta amyloid proteins together to form large, multi-protein aggregates. They also found the activity of FXIIIa and extent of beta amyloid linkage differed for variants of beta amyloid. As these variants are associated with different probabilities of developing CAA, this suggests a possible role for FXIIIa in CAA and possibly Alzheimer’s disease pathology. Unexpectedly, FXIIIa could also link beta amyloid to fibrin, leading to stiffer clots. This leads to the question, is beta amyloid a normal component of blood clots in the brain, or could its incorporation into clots contribute to CAA? Whether FXIIIa acts on beta amyloid in physiological settings has yet to be determined. To establish this, experiments using animal models will be required. Furthermore, it is still unclear whether FXIIIa contributes to the pathology of CAA and Alzheimer’s disease. However, the work described here helps strengthen the bridge between Alzheimer’s disease and blood clotting. Characterizing these connections is the first step in understanding what causes Alzheimer’s disease, and eventually finding a cure. Love, S., Miners, S., Palmer, J., Chalmers, K., and Kehoe, P. (2009) Insights into the pathogenesis and pathogenicity of cerebral amyloid angiopathy. Frontiers in Bioscience. 14, 4778-4792.